There are a couple of common approaches to naming a Pit Bull. Due to the stocky and powerful figure, many Pit Bull owners seek an equally strong name. Many good ideas for tough sounding names can be derived from metals, Greek gods, and weapons. Pit Bulls are notorious for their protective nature and this can cause fear among house guests. A second approach that owners take is to give their Pit Bull a name that sounds sweet and innocent. This can help to ease any discomfort that guests may have. People are less likely to fear your dog named 'Marshmallow' and more likely to fear one named 'Jack the Ripper'. This list of Pit Bull names is comprised mainly of stronger sounding names that fit the build and stereotype of the breed. Some of our pages will contain a subcategory. A subcategory is a slightly more specific grouping than the main topic of the page. For a subcategory, we will include a separated table of names and corresponding descriptions. An example of a subcategory of Red Dog Names would be 'Dog Names Inspired by Red Wines'. 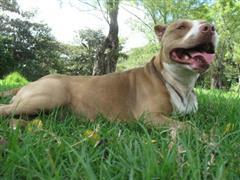 If you have any subcategory ideas for the Pit Bull Names page, we would love to hear them. Use the form below to submit your ideas.